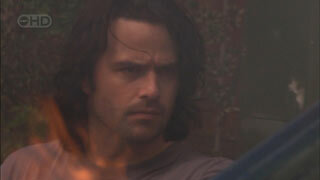 Dan walks out with the washing basket and yells for Toadie when he sees the cubby house up in flames. Toadie rushes down the stairs and takes the hose off Callum (who was attempting to put it out). Steph and Jay appear and Jay immediately takes over dousing duties to appear all heroic. Later, Toadie has sat Callum down on the steps for a chat. He wants to know how the fire started, but Callum has no clue; he just tried to put it out. Disappointed that Callum appears to be lying, Toadie sends him inside. Harold is pleased to hear that Carmella has decided to attend the funeral after all. Carmella is about to iron a black dress when Marco appears and ridicules her depressing attire. He jokes that he's not coming if she's going to wear that. 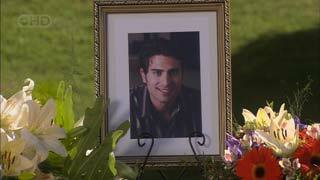 Carmella tells him that he has to - it's his funeral - but Marco just laughs and says that sounds weird. He's apparently been haunting Trinny and Susannah in the afterlife, as he then tells Carm to wear her colourful maternity dress. He fell in love with her in that dress. Carmella smiles and agrees. MARCO: Promise, cross your heart. Rebecca and Oliver walk in, cutting the moment short. Oliver makes up some lie about his hotel room flooding and needing a place to stay, but soon confesses that he just wants to keep Carmella company for a few days. Carmella warily agrees. 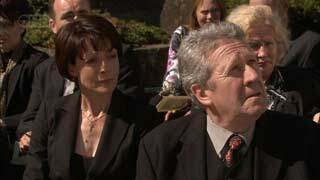 Declan tells Didge that he's not going to the funeral, but neither is Didge as she's got somewhere else to be. Declan wonders where she's been disappearing to the past couple of days, but even the threat of tickling won't make Didge reveal the truth. Steve angrily walks in with the phone bill, telling Didge off for sending hundreds of text messages to Declan. STEVE: He lives next door! You could put your head out the window and yell! Declan makes a hasty retreat, as does Didge who warns her dad not to freak out. She's going to pay for it. And how is she going to pay for it? With her new receptionist job at the gym of course. This new set is kind of Home & Away-ish, and gives ample opportunity for the viewer to perv on sweaty dudes and dudettes as they work out on the treadmills. Declan has followed Didge there to see what she's getting up to. DECLAN: (in a nerdy voice) Excuse me miss, is this where I get big muscles? Didge explains to Declan that she had to keep her job a secret because her dad doesn't want her to get distracted from her school work. They agree to meet up in Didge's lunch break, but Declan won't leave her alone till he's got a kiss. 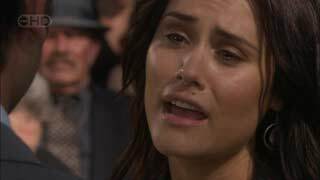 Carmella tells Rebecca that she doesn't need Oliver to baby-sit her, but Rebecca replies that Carmella isn't as resilient as she thinks she is. She admits that she overheard Carmella talking to “Marco”. Embarrassed, Carmella vehemently denies it and pretends that she was just talking on her mobile with the earpiece in. Harold, Oliver and Rebecca file outside to the car, giving Carmella a few moments alone. But she's not alone for long as Marco the friendly ghost steps out from the laundry. He promises Carmella that he'll be there to support her if she needs him. Carmella asks him what she should say in her eulogy, but Marco just replies that she'll know what to do when the time comes. MARCO: Come on, can't be late for my own funeral. [Laughs] That's another one! I am one dead funny guy! The funeral is set outside with two rows of mourners behind the casket. 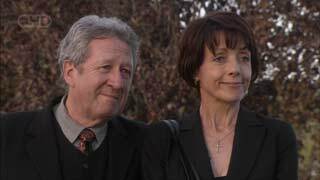 Marco's parents are there, along with a strong Ramsay Street contingent consisting of Steve, Miranda, Dan, Libby, Lou, Sienna and Elle. They all turn to look at Carmella when she arrives with Oliver, Rebecca and Harold. 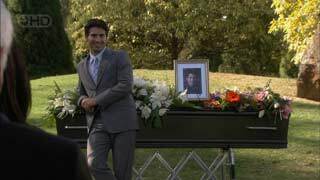 Libby asks how Carmella's doing, but Carmella is distracted - there are lilies on the casket instead of roses. Lou then tells her that he and Sienna wanted to say a few words, but the Silvanis said there wouldn't be enough time. Carmella goes to have a word with Patrizia and Franco, but Patrizia is in no mood to play nice. She berates Carmella for her choice of clothing and then spits out that Marco's death is all Carmella's fault. Libby comes to check on Carmella, who is sitting by herself crying. Libby admits that she can't imagine what it would be like to lose a child - but she still wanted to slap Patrizia for what she said. Carmella thinks it would just be easier for her to stay out of the way, but Libby doesn't agree. 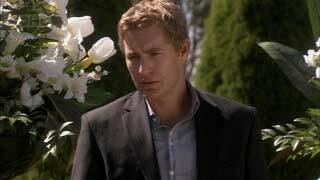 Lib reveals that when Drew died she wanted the whole world to know that he was the love of her life, and that part of her died the day he did. Dan (who has overheard this last exchange as we can't go a day without some Dan/Libby angst), lets them know that the priest has arrived. Carmella gives Libby a grateful hug. Declan and Didge have lit a candle for Marco and Didge reads out a passage from the bible. After they pay their respects, Didge gives Declan a present she bought with her first wage - a very expensive t-shirt. Declan's stoked, but says it's too much, but Didge is quite happy to spend money on her “hot boyfriend”. DECLAN: It's still too much. DIDGE: I want to give you everything. I believe that's quite a big winky nudge to TITTNL™ (Taking It To The Next Level). They have big ‘ol smooch. Jay and Steph are running very late for the funeral, and Steph appears to be wearing a funeral mini-dress. Perhaps the wake is at a disco. Jay starts to kiss her and gets all inappropriately gropey for the occasion, but stops when Toadie walks in. He's there to apologise to Steph for not believing her about Callum, but he still can't quite believe that Callum would start a bushfire. Chipping in with his 2c, Jay says that Callum may have set the cubby alight to be a copycat or as an act of defiance. He tells Toadie that his fire department runs a Fire & Intervention Awareness program that Callum could take part in. Toadie appreciates the gesture, but also looks quite wary of Jay at the same time. Steph quietly apologises to Carmella (who is sitting up the back) for their lateness. The Silvanis stand up to speak, but it's all too much for Franco so Patrizia takes over. She tells the crowd how much love and respect Marco had for his family. Oliver gives Carmella's hand a comforting squeeze. Carmella closes her eyes and thinks back to her first kiss with Marco, but when she opens them again she sees Marco standing next to his coffin smiling at her. Her face brightening, she smiles back. Toadie watches Callum listening to his iPod, not knowing what to say. Didge and Declan snuggle contentedly on the couch. The crowd watches as Carmella continues to sing to the casket, but Carmella is looking into Marco's eyes the whole time. Touched, Marco starts to clap when she's finished (but you can't hear any sound which is a nice touch). Applause can soon be heard from friends and family. Marco stands behind Carmella. MARCO: Thank you. Time for me to go. CARMELLA: No, I'm not ready. MARCO: You are, Bella, you are. Marco strolls through the middle of everyone as they walk up to hug Carmella. She strains to catch one last glimpse of him through the masses of people, and Marco blows her a kiss before walking off into the distance. Fade to the casket being wheeled into the funeral car. Carmella stands with Libby and Sienna while they try and comfort her, but she spies the back of someone who looks like Marco and quickly excuses herself. Patrizia and Franco stop her along the way and quite apologetically say that they'd like Carmella to visit them with Chloe from time to time. Assuring them she will, Carmella rushes over to where she sighted Marco but there's no one to be found. Oliver wonders whether he should go to her but Libby says she just needs some time alone. Sighing, Carmella resigns herself to the truth. CARMELLA: You've gone haven't you. There's a beautiful shot as the camera lifts up into the sky to show Carmella standing by herself. Didge and Declan are having a snogging session on the couch. Didge has ended up wearing Declan's new t-shirt over her clothes while Declan is pleasingly shirtless. Steve walks in on them and cries out in surprise, causing Declan to fall off the sofa. Steve grumbles that he thought Didge was going to be out all day. DIDGE: I came back for lunch. Steve is flustered because he thinks the teens are taking things too quickly, but Didge tells her dad that he has to trust her. Declan plays the nervous boyfriend card and says they could take things a little slower, which Steve agrees with, but Didge defiantly says that it's her life and she likes where it's going. She grabs Declan's hand and drags him out the door, announcing that she's off to work. DIDGE: Yeah, I got a job to pay for that phone bill. Rebecca offers to put Chloe to bed for Carmella. Wrung out, Carmella asks Marco if he's still there but he doesn't appear. Resting her head on the kitchen bench, she sadly says that she misses him and just wants to hold him. Overhearing her from the hall, Oliver sympathetically walks up behind her and gives her a hug. Mistaking him for Marco, Carmella spins around and kisses him, both of them reeling in surprise when they realise what they're doing. Carmella tells Oliver off and Oliver hastily apologises before rushing out the door. Rebecca looks on in concern from the hall. Jay has lit a whole bunch of candles in the lounge room. He loves fire this one. Steph walks in and wonders what he's doing, but Jay just replies that he needed some romantic lighting to assist him with what he's about to say. JAY: I'm falling in love with you, Steph. I just need you to know that.